In honor of the Clone (my youngest daughter) whose birthday is tomorrow and who loves anything with pasta, this is for you, baby! We actually had this last week, as we have to have something akin to spaghetti at least once a week for the clone, but I just haven’t had time to post much since it has been a hectic week for me at work. This is you basic tomato sauce, only with italian sausage instead of plain ground meat. 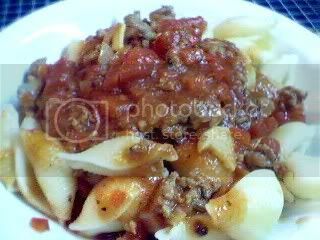 My basic spaghetti sauce recipe is here. I took the sausage out of the casing, since for some reason the Clone will not eat sliced sausages in her sauce. She like it this way though.